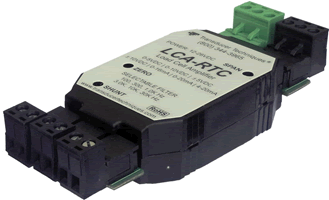 The LCA-RTC Module provide low-cost, dedicated signal conditioning for a single bridge type load cell or torque sensor. 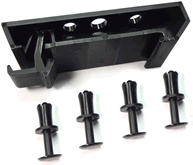 Model LCA-RTC comes with removable screw-clamp terminal connectors, which accept wires without soldering. On- board jumper selections include sensitivities from 0.5 mV/V to 10 mV/V, bandwidths from 100 Hz to 30 kHz, and amplified outputs of 0 to ±5V, 0 to ±10V, 0-16 mA, 0-20 mA or 4-20 mA. Zero and span adjustments are via precision 25-turn low-tempco metal film potentiometers. The units can be operated next to the sensor with 4-wire hookup or at distances up to 1 km (3300 feet) with 6-wire hookup. An onboard 87.325 kΩ resistor allows easy shunt calibration at the push of a button. Provision is also made for a user-furnished calibration resistor. Power requirements are 11.8 to 26V DC with load currents from 10 to 60 mA, the latter applying when the unit provides 10V DC excitation to a 350 ohm load cell and delivers a 20 mA analog output. See chart on page 12. 0.0025% of span max / 1Ω (sum of + and - excitation in lead resistance. For length, make allowance for user furnished DB9 mating connectors. For length, add 10 mm (0.4”) on each side for furnished cable connectors.